All Saints Spitalfield is a British fashion brand that arrived in America in 2010. There is a need to increase brand awareness. 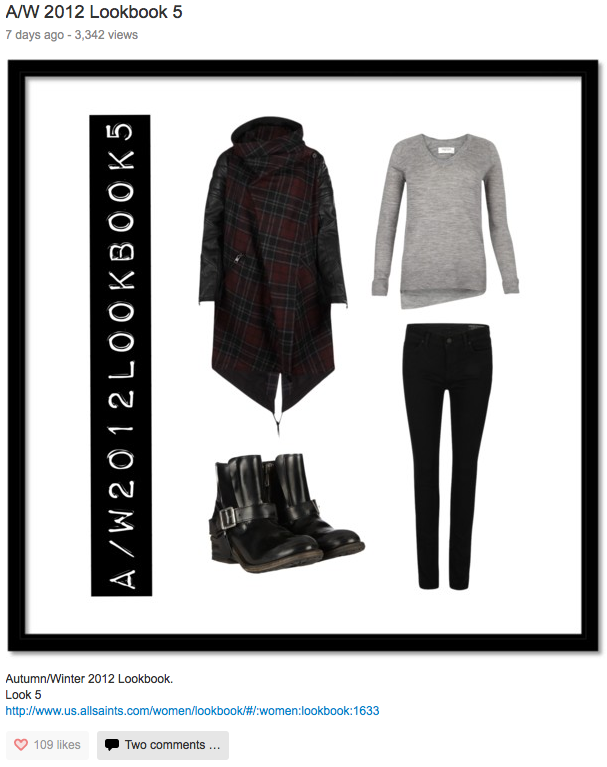 Through AllSaints’s partnership with Polyvore, engage Polyvore users to achieve top impressions and engagements. Strategically promote relevant items, create collections and sets, promote user created sets, and interact with users. From this analyze what decisions get the best response from users and adapt the strategy accordingly. From the activities on Polyvore that I am responsible for, AllSaints is the top ranked brand on Polyvore. Online sales have increased since I began leading the AllSaints Polyvore page. Press events are created to present new collections to fashion influencers. For the Autumn/ Winter 2012 collection, All Saints hosted a three day press event for editors, bloggers, and members of the fashion industry to get first looks at the new collection. the head designer to understand the design, material, and asthetic choices and details. I created gift bags for guests who attended the event, posted to the company’s social media sites during the event, and greeted and checked in guests upon their arrival. The Autumn/Winter 2012 press event created buzz and awareness about the upcoming collection to be introduced into stores later in the year.